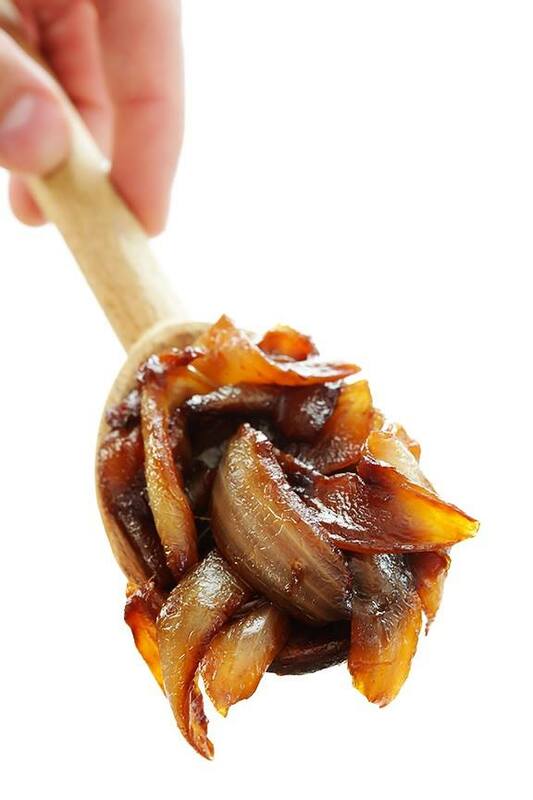 Learn how to make caramelized onions with this step-by-step procedure. Heat butter in a large sauté pan over medium heat until melted. Add onions, and toss until they are coated in the butter. Cook the onions for the next 40 minutes or so until they are caramelized, using a spatula to stir the onions and scrape the bottom of the pan every 3-5 minutes. As the onions begin to caramelize and darken, you may need to scrape the pan more often. Once the onions reach a deep golden brown color and are nice and syrupy, sprinkle them with a pinch of two of salt (and sugar, if desired). Stir the stock a tablespoon or two at a time, adding enough so that the browned bits on the bottom of the pan loosen when scraped with a spatula. Stir the onions for 1 more minute, being sure to stir in the browned bits, then remove from heat. Serve immediately. Or let cool to room temperature, then refrigerate in a sealed container for up to 3 days, or freeze for up to 3 months. Enjoy!